Ever since man began to need to move things, he has used round rollers to make the job easier. Probably the first rollers were sticks or logs, which were a big improvement over dragging things across the ground, but still pretty hard work. Egyptians used logs to roll their huge blocks of stone for the pyramids. Eventually, someone came up with the idea of securing the roller to whatever was being moved, and built the first "vehicle" with "wheels." However, these still had bearings made from materials rubbing on each other instead of rolling on each other. It wasn't until the late eighteenth century that the basic design for bearings was developed. In 1794, Welsh ironmaster Philip Vaughan patented a design for ball bearings to support the axle of a carriage. Development continued in the nineteenth and early twentieth centuries, spurred by the advancement of the bicycle and the automobile. There are thousands of sizes, shapes, and kinds of rolling bearings; ball bearings, roller bearings, needle bearings, and tapered roller bearings are the major kinds. Sizes run from small enough to run miniature motors to huge bearings used to support rotating parts in hydroelectric power plants; these large bearings can be ten feet (3.04 meters) in diameter and require a crane to install. The most common sizes can easily be held in one hand and are used in things like electric motors. This article will describe only ball bearings. In these bearings, the rolling part is a ball, which rolls between inner and outer rings called races. The balls are held by a cage, which keeps them evenly spaced around the races. In addition to these parts, there are a lot of optional parts for special bearings, like seals to keep oil or grease in and dirt out, or screws to hold a bearing in place. We won't worry here about these fancy extras. Almost all parts of all ball bearings are made of steel. Since the bearing has to stand up to a lot of stress, it needs to be made of very strong steel. The standard industry classification for the steel in these bearings is 52100, which means that it has one percent chromium and one percent carbon (called alloys when added to the basic steel). This steel can be made very hard and tough by heat treating. Where rusting might be a problem, bearings are made from 440C stainless steel. The cage for the balls is traditionally made of thin steel, but some bearings now use molded plastic cages, because they cost less to make and cause less friction. There are four major parts to a standard ball bearing: the outer race, the rolling balls, the inner race, and the cage. Surprisingly, the rolling balls start out as thick steel wire. Then, in a cold heading process, the wire is cut into small pieces smashed between two steel dies. The result is a ball that looks like the planet Saturn, with a ring around its middle called "flash." usually warps during this process. They can be machined back to their finished size after heat treating. 2 The rough cut races are put into a heat treating furnace at about 1,550 degrees Fahrenheit (843 degrees Celsius) for up to several hours (depending on the size of the parts), then dipped into an oil bath to cool them and make them very hard. This hardening also makes them brittle, so the next step is to temper them. This is done by heating them in a second oven to about 300 degrees Fahrenheit (148.8 degrees Celsius), and then letting them cool in air. This whole heat treatment process makes parts which are both hard and tough. 3 After the heat treatment process, the races are ready for finishing. However, the races are now too hard to cut with cutting tools, so the rest of the work must be done with grinding wheels. These are a lot like what you would find in any shop for sharpening drill bits and tools, except that several different kinds and shapes are needed to finish the races. Almost every place on the race is finished by grinding, which leaves a very smooth, accurate surface. The surfaces where the bearing fits into the machine must be very round, and the sides must be flat. The surface that the balls roll on is ground first, and then lapped. This means that a very fine abrasive slurry is used to polish the races for several hours to get almost a mirror finish. At this point, the races are finished, and ready to be put together with the balls. The bulge around the middle of the rolling balls is removed in a machining proess. The balls are placed in rough grooves between two cast iron discs. One disc rotates while the other one is stationary; the friction removes the flash. From here, the balls are heat treated, ground, and lapped, which leaves the balls with a very smooth finish. heated before being smashed, and that the original use for the process was to put the heads on nails (which is still how that is done). At any rate, the balls now look like the planet Saturn, with a ring around the middle called "flash." 5 The first machining process removes this flash. The ball bearings are put between the faces of two cast iron disks, where they ride in grooves. The inside of the grooves are rough, which tears the flash off of the balls. One wheel rotates, while the other one stays still. The stationary wheel has holes through it so that the balls can be fed into and taken out of the grooves. A special conveyor feeds balls into one hole, the balls rattle around the groove, and then come out the other hole. They are then fed back into the conveyor for many trips through the wheel grooves, until they have been cut down to being fairly round, almost to the proper size, and the flash is completely gone. Once again, the balls are left oversize so that they can be ground to their finished size after heat treatment. The amount of steel left for finishing is not much; only about 8/1000 of an inch (.02 centimeter), which is about as thick as two sheets of paper. 6 The heat treatment process for the balls is similar to that used for the races, since the kind of steel is the same, and it is best to have all the parts wear at about the same rate. Like the races, the balls become hard and tough after heat treating and tempering. 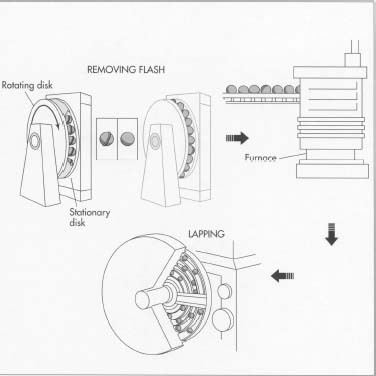 After heat treatment, the balls are put back into a machine that works the same way as the flash remover, except that the wheels are grinding wheels instead of cutting wheels. These wheels grind the balls down so that they are round and within a few ten thousandths of an inch of their finished size. 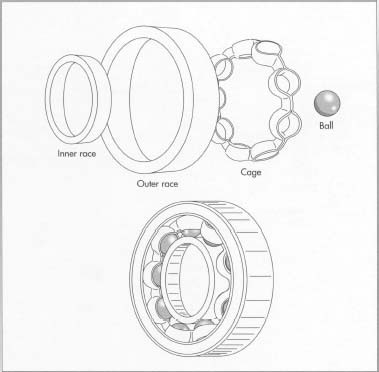 The four parts of a finished ball bearing: inner race, outer race, cage, and ball. how precise a bearing they are being made for. Once again, the result is steel that is extremely smooth. 8 Steel cages are stamped out of fairly thin sheet metal, much like a cookie cutter, and then bent to their final shape in a die. A die is made up of two pieces of steel that fit together, with a hole the shape of the finished part carved inside. When the cage is put in between and the die is closed, the cage is bent to the shape of the hole inside. The die is then opened, and the finished part is taken out, ready to be assembled. 9 Plastic cages are usually made by a process called injection molding. In this process, a hollow metal mold is filled by squirting melted plastic into it, and letting it harden. The mold is opened up, and the finished cage is taken out, ready for assembly. 10 Now that all of the parts are made, the bearing needs to be put together. First, the inner race is put inside the outer race, only off to one side as far as possible. This makes a space between them on the opposite side large enough to insert balls between them. The required number of balls is put in, then the races are moved so that they are both centered, and the balls distributed evenly around the bearing. At this point, the cage is installed to hold the balls apart from each other. Plastic cages are usually just snapped in, while steel cages usually have to be put in and riveted together. Now that the bearing is assembled, it is coated with a rust preventative and packaged for shipping. Bearing making is a very precise business. Tests are run on samples of the steel coming to the factory to make sure that it has the right amounts of the alloy metals in it. 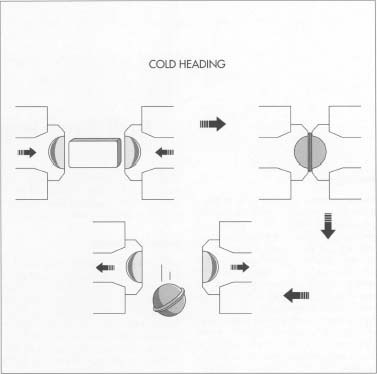 Hardness and toughness tests are also done at several stages of the heat treating process. There are also many inspections along the way to make sure that sizes and shapes are correct. The surface of the balls and where they roll on the races must be exceptionally smooth. The balls can't be out of round more than 25 millionths of an inch, even for an inexpensive bearing. High-speed or precision bearings are allowed only five-millionths of an inch. Ball bearings will be used for many years to come, because they are very simple and have become very inexpensive to manufacture. Some companies experimented with making balls in space on the space shuttle. In space, molten blobs of steel can be spit out into the air, and the zero gravity lets them float in the air. The blobs automatically make perfect spheres while they cool and harden. However, space travel is still expensive, so a lot of polishing can be done on the ground for the cost of one "space ball". Other kinds of bearings are on the horizon, though. Bearings where the two objects never touch each other at all are efficient to run but difficult to make. One kind uses magnets that push away from each other and can be used to hold things apart. This is how the "mag-lev" (for magnetic levitation) trains are built. Another kind forces air into a space between two close-fitting surfaces, making them float apart from each other on a cushion of compressed air. However, both of these bearings are much more expensive to build and operate than the humble, trusted ball bearing. Deere & Company Staff, eds. Bearings & Seals, 5th ed. R. R. Bowker, 1992. Eschmann, Paul. Ball & Roller Bearings: Theory, Design & Application, 2nd ed. Harris, Tedric A. Rolling Bearing Analysis, 3rd ed. John Wiley & Sons, Inc., 1991. Houghton, P. S. Ball & Roller Bearings. Elsevier Science Publishing Company, Inc., 1976. Nisbet, T. S. Rolling Bearings. Oxford University Press, 1974. Shigley, J. E. Bearings & Lubrication: A Mechanical Designer's Workbook. McGraw-Hill, Inc., 1990. Gardner, Dana. "Ceramics Adds Life to Drives," Design News. March 23,1992, p. 63. Hannoosh, J. G. "Ceramic Bearings Enter the Mainstream," Design News. November 21, 1988, p. 224. McCarty, Lyle H. "New Alloy Produces Quieter Ball Bearings," Design News. May 20, 1991, p. 99. This site is very useful for us. i m a engineering student this is very in our study. Actually, I joined in a bearing manufacturing company, I learnt a lot through this info. It's really good. from the basic process, it is available.. It is very helpful to me.For all mechanical engineers,the info should be useful.